The 2017 National Finals will be held April 25-26, 2017 at the Lisner Auditorium at The George Washington University. The semifinals and finals will be webcast live. Cheer on our State Champion MaryKate Wright from Owosso High School on Tuesday, April 25 – 1:00 p.m. – 4:00 p.m. FOLLOW: Poetry Out Loud is on Twitter at @PoetryOutLoud and @NEAarts, #POL17. 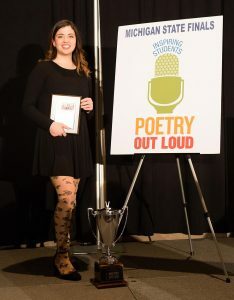 MaryKate Wright of Owosso High School, was named the 2017 Michigan Poetry Out Loud State Champion after a day-long recitation competition at Lansing Convention Center in Lansing on March 3. Ms. Wright took top honors among 39 student competitors, reciting “When You Are Old” by William Butler Yeats in her final round. 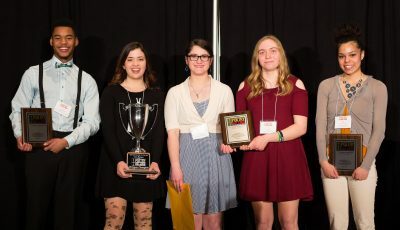 First runner-up was Lyndon DeFoe of University High School Academy in Lathrup Village, second runnerup was Arrianna Lister of Roosevelt High School in Wyandotte, and a tie for third runner-up was Paige MacGillis of Williamston High School and Grace Garver of Petoskey High School. As the state champion, MaryKate received a $200 cash award, $500 stipend for her school and an all-expenses-paid trip to Washington, D.C. to represent Michigan at the National Poetry Out Loud competition in April 2017. The national competition will be live-streamed at www.poetryoutloud.org. Lyndon, as runner-up, received a $100 cash award and $200 for his school. All five state finalists will receive plaques commemorating their achievement. The national champion will receive a $20,000 college scholarship. Poetry Out Loud, a national high school recitation competition, encourages youth to learn about great poetry through memorization and performance, while also mastering public speaking skills, building self-confidence and learning about literary heritage. The program has engaged more than 70,000 students since the Michigan Humanities and Michigan Council for Arts & Cultural Affairs began hosting it in 2005. The program is open to all high schools, including home-school groups. Registration for the next program will open this fall. If teachers or parents would like to learn more about this program, please visit www.michiganhumanities.org or call 517-372-7770.